Seven totally natural, undyed shades of pure Shetland wool. Each shade is are either as they are on the sheep or carefully blended from the natural wool. Bringing Shetland to your doorstep no matter where that be. It's beautifully soft and perfect for natural colourwork and cables. 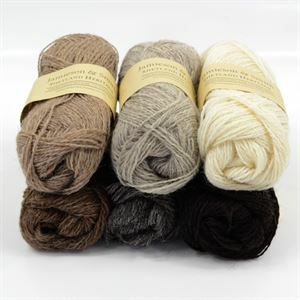 This J&S Jumper Weight yarn can also be used in patterns calling for 4 ply yarn. Each ball is a 25g with 110m (120 yds) of yarn.